Happy New Year to the readers of The Rafu Shimpo! The start of the new year is a good time to reflect. I’ve been thinking about all the Japanese American women who have blessed my life —aunties, grandmas, friends, friends of my parents, clients and most importantly, my own mom. Issei and Nisei women are extraordinary in so many ways. I’d like to share a few stories with the readers of The Rafu, starting with lessons I’ve learned from my mom. One of the things that’s so great about my mom is that she’s totally ordinary. But then again, she’s not. She grew up in a farm laboring family in Lodi, Calif. She was one of 13 children, but two died in childhood. All helped around the home from a young age. Then when she was old enough, she cared for kids and did domestic work in other people’s homes. Like all but one of the 11 siblings, she didn’t attend college. She was a secretary, then a medical assistant, and a wife, mother and grandmother. Which is a common background for a Nisei woman. The things that are unusual about her are that she worked for almost 30 years and did not miss one single day of work. She’s 77 years old now and she walks five miles almost every day. She regularly pulls her own golf clubs even in the 100-degree San Fernando Valley heat, and with the assistance of a 75-plus-year-old man, she can drain 50 pounds of boiling noodles when she makes spaghetti breakfast for homeless people at the church ministry. When I was at home recently, I went on one of her early morning walks. We saw a can in the gutter. She collects cans and bottles and gives the recycling proceeds to her grandchildren so they can have a little extra spending money. I thought she was going to pass the can up because she had forgotten to bring along a collection bag. But she produced the bag from her pocket and scooped up the can. You’ve got to move quickly when you go on walks with my mom. If you slow down, she just keeps on going. I was a few paces behind her for part of the walk. She didn’t point out my lagging that day, but the next day she reminded me, “You can’t be dilly-dallying!” A much-needed word of advice for me as I start off the new year. I try to observe her and learn from her and listen to the things she has to say about my baachan. They were both super industrious women and I need all the wisdom I can gather as I run a business, a family, and try to keep up with the demands of everyday life. Laurie Shigekuni has practiced estate planning, probate and trust administration law since 1996. She graduated from UC Santa Cruz in 1983 and UC Hastings College of the Law in 1989. 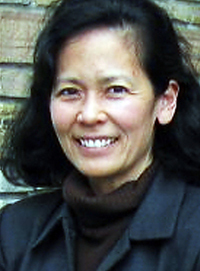 Laurie Shigekuni & Associates has offices in Pasadena and San Francisco. Additional information can be found at www.calestateplanning.com. Opinions expressed are not necessarily those of The Rafu Shimpo.